Possum Kingdom State Park is the ideal place to spend time with the family, with fun on both water and land. With 20,000 acres of clear, blue water in the rugged canyon country of the Palo Pinto Mountains, there’s something to for everyone. 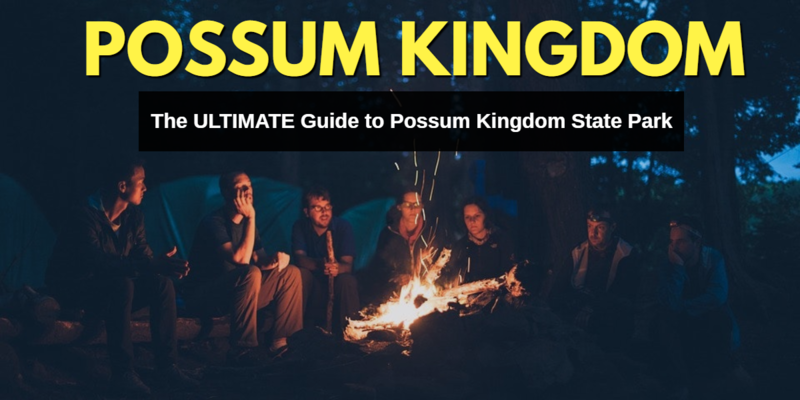 Check out our ultimate guide to Possum Kingdom Lake, and be sure to let us know how you enjoyed your visit! Looking for a fun way to cool off and enjoy a day with the family? Grab your swimsuit and head down to Possum Kingdom Lake, where you can swim, boat, fish, ski, scuba dive and snorkel. Fishing enthusiasts can fish for largemouth, striped and white bass as well as channel and blue catfish and white crappie. Possum Kingdom Lake has a boat launch, fishing pier and fish cleaning station, and you do not need a fishing license to fish from the shore. The park offers rentals on canoes, boat slips, wakeboards, kneeboards, water skis and tubes. Another fun feature of Possum Kingdom Lake is Hell’s Gate, the premier party area that is also home to one of the most massive fireworks displays in the state of Texas on the Fourth of July. Hell’s Gate is defined by two huge cliffs that stand as gates to the entry to a cove on the south end of the lake. During the summer, boaters come to Hell’s Gate to tie up, relax, party and have a good time. With over 300 miles of shoreline and many scenic coves, Possum Kingdom Lake is the perfect place to relax. At Possum Kingdom State Park you can camp, picnic, hike, bike, study nature and geocache. Visitors can stay overnight in one of the park’s air-conditioned cabins or choose a from a variety of campsites: water and electricity sites, water-only sites or primitive walk-in sites. The Possum Kingdom State Park Store offers groceries, camping and fishing supplies as well. The hills that surround Possum Kingdom Lake are ideal for both casual and serious hikers and bikers. A 16-mile hike and bike trails located off LaVilla Road offers several trailheads with restrooms and public parking. This trail also provides access to the top of a 90’ high peak that has a wonderful view of the lake. The hiking and biking trails are free to the public and are available year-round, weather permitting. When the kids are happy, all is well! Young visitors to Possum Kingdom Lake have the opportunity to become junior rangers. The free Junior Ranger Youth Explorer Program helps kids learn about nature by drawing, writing and observing. The Junior Ranger Explorer Packs provide tools kids can use to explore nature. Children can pick up a free Junior Ranger Journal when they visit a state park and complete a certain number of activities to earn a Junior Ranger pin. The Junior Ranger Explorer Packs are available at park headquarters for children to borrow. Each backpack comes with binoculars, a magnifying glass, animal tracking key, and guides to flowers, birds, butterflies, trees, rocks, wildflowers and plants. The packs also include crayons and watercolors along with a journal and sketchbook. Mini Explorer Packs are available at some of the park stores so children can explore in their backyard. Possum Kingdom Lake offers a variety of options to stay, including cabin rentals, guest houses, hotels, RV camping and tent camping. Be sure to check out all your options and see what works best for you and your family! Possum Kingdom Lake offers a wide variety of dining options, from Mexican to America, pizza to pasta, chicken fried steak to USDA prime steaks, and much more. Click here for a full list of dining options. Possum Kingdom Lake lies between three thriving towns: Graham, Mineral Wells and Breckenridge. In these towns, visitors can find history and art museums, entertainment, restaurants and more. Nearby is the Fort Richardson State Park, Historic Site and Lost Creek Reservoirs State Trailway, where visitors can find restored fort structures, such as a hospital, officer’s quarters, morgue, commissary and bakery. The trailway features a 10-mile hiking, biking and equestrian trail that runs adjacent to Fort Richardson along Lost Creek.